The world champion didn’t budge an inch and rode to a laboured victory in Lourdes which reinstates Bou on the top of the TrialGP podium. Alongside him on the rostrum was Jaime Busto, who after having clinched a first-ever podium last weekend, has clearly taken a liking to the flavour of success. 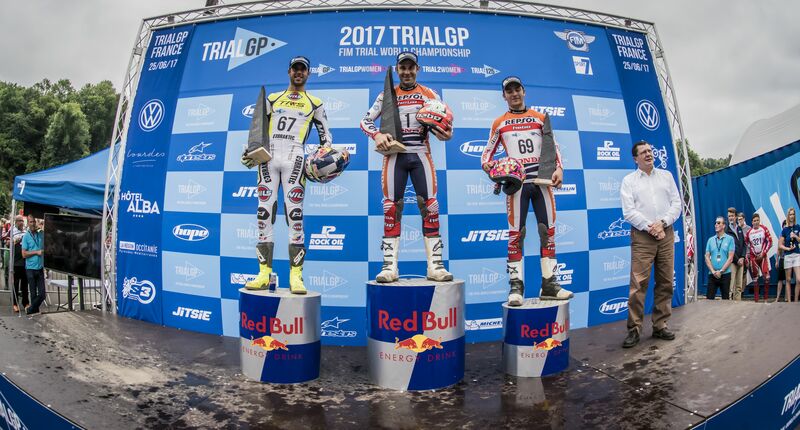 An excellent day all round for Repsol Honda Team in this fourth round of the TrialGP World Championship where a fourth place for Takahisa Fujinami can be added the first and third places of Toni Bou and Jaime Busto. The Lourdes escapade was a demanding one. The morning rain had left most of the sections muddy and meant that good results were an arduous challenge. To complicate proceedings further, the maximum permitted times on the first lap were so tight that they led to a string of penalizations. 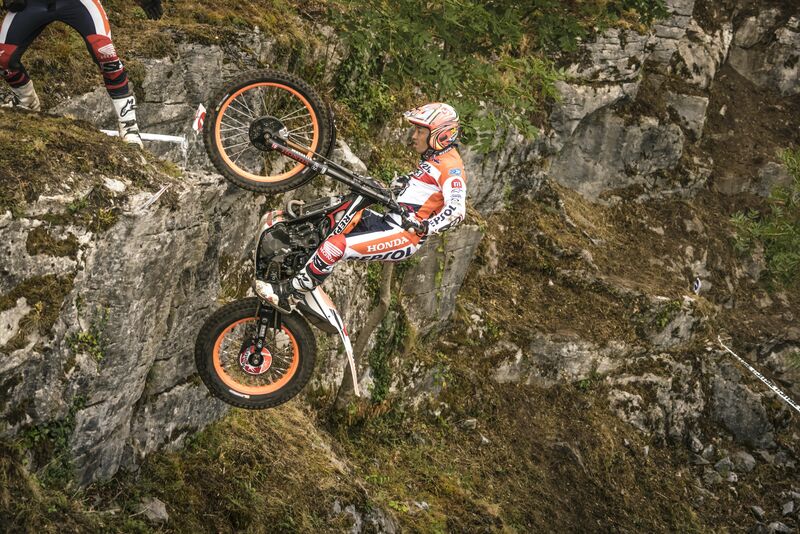 Toni Bou picked up a couple of fives in the more delicate sections on the first lap, before completing the second round in better conditions, mistake-free, for an accumulated total of twenty-one marks, six of which were for time penalties. Bou lengthens his advantage in the overall standings to thirteen points over nearest second place rival Adam Raga, who finished today behind the champion. 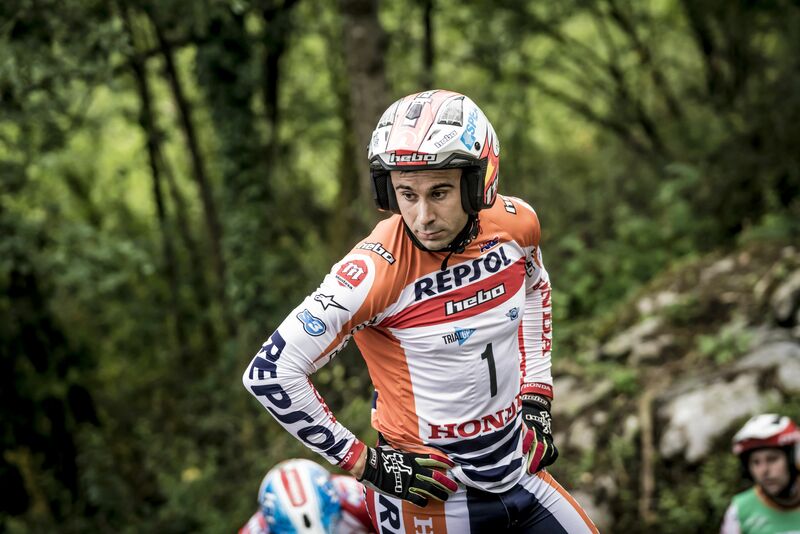 Basque rider Jaime Busto, Toni’s sidekick in the Repsol Honda Team, replicated his podium finish of last week where he had taken runner-up spot in Andorra. Busto posted third today after a fine display of quality. The score-count on the second lap was far lower than the first time around, with seven marks out of a total of forty-eight. 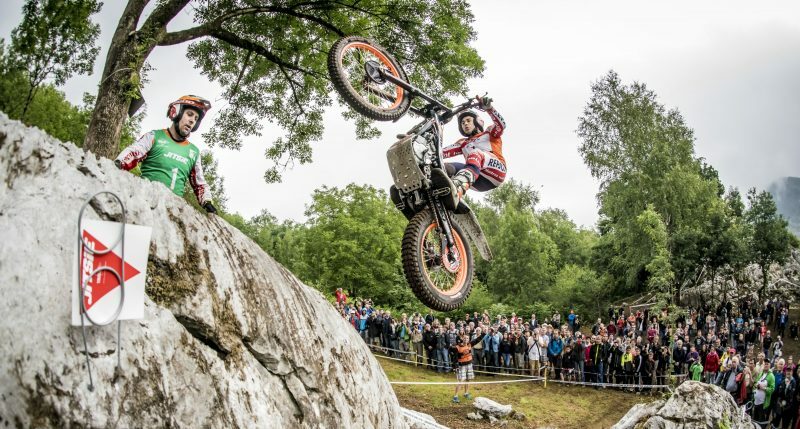 Takahisa Fujinami too was in a constant battle for a podium place, although errors in the final sections of the first lap proved costly. Today’s fourth place does, however, leave the Japanese rider equal on points with team-mate Busto in the overall standings. In the constructor’s championship, Montesa continues to lead and pulls further ahead with a 37-point advantage. 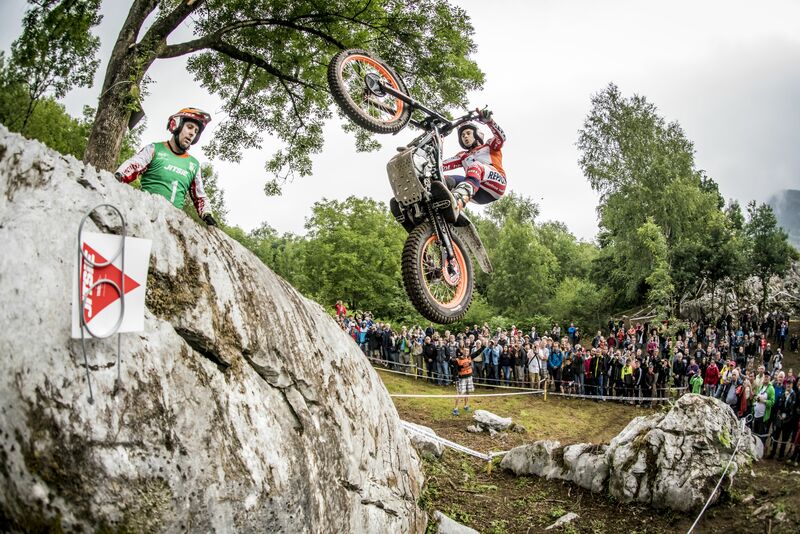 The fifth and next round of the TrialGP World Championship takes place on June 9th in Tong, United Kingdom. After the Andorra trial, getting the good sensations back was very important for me and I struggled to be comfortable in this trial. Yesterday I got the pole and today I was able to ride well on the bike and managed a zero on lap two. Everything has gone very well and this victory is very important for the championship. I also want to congratulate Jaime for joining me on the podium. He has an incredible level and I knew that these good results would come. It has been a very good weekend and I am very happy about how everything went. I think that the first half the race was not bad, but the time was stressing me out and I picked up five in the final section. I think I could have got onto the podium and that has annoyed me a bit. On the second lap I kept it together and stayed close to Jaime, who has achieved his second podium of the year. I think we should congratulate Toni, and also Jaime too. My result is not bad, considering that I have been close on points to a podium place. I am very happy because it has been a difficult trial for me. 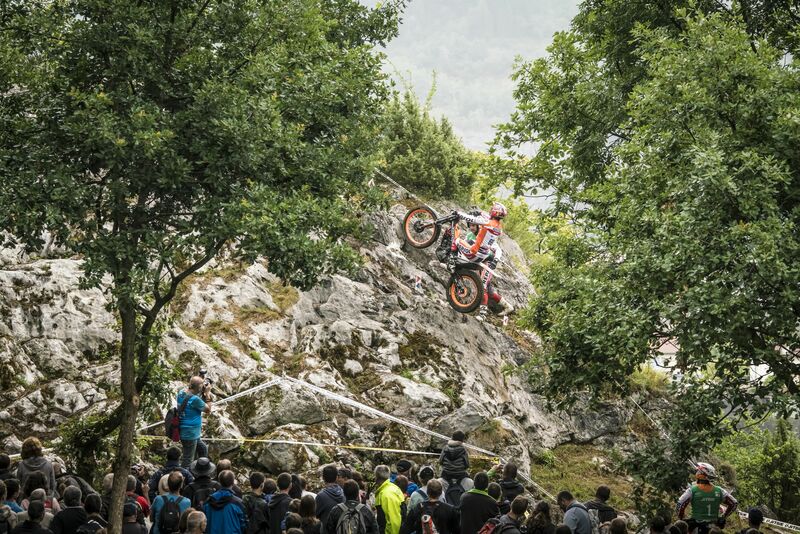 I had damaged ribs from the Andorra trial, and they caused me a lot of pain, even so, once in the competition I was able to handle the whole event quite well. The sections, on the first lap were fine, and after drying out it got a bit easier. After the results in Andorra, which were not what we had hoped for, the riders worked hard to get this good overall result for the team. And I want to congratulate them on this, for the victory of Toni, the laboured podium place of Jaime’s and for the fourth place of Fujinami, who had been looking for the podium since the beginning. We will continue to struggle to try to repeat and improve, although it is not easy because Adam is a great rival. We are also very happy for the victory of Gabriel Marcelli in Trial2, which helps us to keep ahead in the constructor’s championship. This entry was posted in Featured, Global News, Moto, Motorsports, Offroad by admin. Bookmark the permalink.